It’s clear that Germany’s iconic Vitra Design Museum has a big fan. 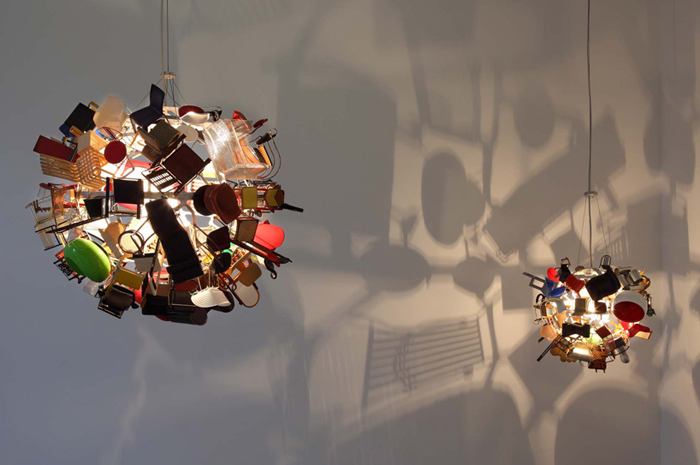 Italian designer Paola Pivi has paid homage to the museum’s collection by turning some its most iconic pieces into “Nice Ball,” a pendant lamp constructed of an “explosion” of model furniture. The 80 miniature chairs, tables and consoles that were used are modeled after actual pieces in the museum’s permanent collection, and are sold as trinkets in Vitra’s museum shop. When Nice Ball is illuminated, the shadows cast on the walls fill the room with silhouettes of the Vitra’s collection! As the base of his Nice Ball, Pivi created a spherical metal frame which guards the lightbulb inside. He then attached the model furniture as a shade for the lamp by affixing the pieces to the metal sphere. The conglomerates function both as hanging sculptures, but also as a light installation. Pivi’s lamps are on display until the end of June at the Museum del Novecento in Milan. It's clear that Germany’s iconic Vitra Design Museum has a big fan. 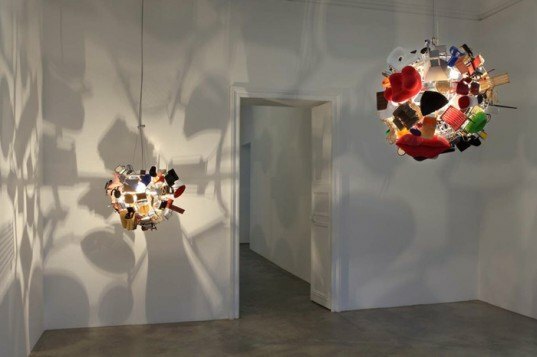 Italian designer Paola Pivi has paid homage to the museum’s collection by turning some its most iconic pieces into “Nice Ball,” a pendant lamp constructed of an “explosion” of model furniture. The 80 miniature chairs, tables and consoles that were used are modeled after actual pieces in the museum's permanent collection, and are sold as trinkets in Vitra's museum shop. When Nice Ball is illuminated, the shadows cast on the walls fill the room with silhouettes of the Vitra’s collection!